Phase II, treatment of pancreatic cancer. Nastorazepide, also known as Z-360, is a selective, orally available, 1,5-benzodiazepine-derivative gastrin/cholecystokinin 2 (CCK-2) receptor antagonist with potential antineoplastic activity. Z-360 binds to the gastrin/CCK-2 receptor, thereby preventing receptor activation by gastrin, a peptide hormone frequently associated with the proliferation of gastrointestinal and pancreatic tumor cells. In January 2018, Zeria is developing nastorazepide calcium (phase II clinical trial), a CCK2 receptor antagonist, for the treatment of pancreatic cancer. Cholecystokinin (CK) is a digestive hormone produced and released in the duodenum, jejunal membrane and is known to have actions such as secretion of secretion, constriction of the gallbladder, stimulation of insulin secretion and the like. C CK is also known to exist in high concentrations in the cerebral cortex, hypothalamus and hippocampus, and it is also known that it has actions such as suppression of food intake, memory enhancement, anxiety action and the like. On the other hand, gastrin is a gastrointestinal hormone produced and released in G cells distributed in the pyloric region of the stomach, and it is known that it has gastric acid secretion action, contraction action of the gastric pyloric part and gallbladder, and the like. These C CK and gastrin have the same 5 amino acids at the C-terminus, and all express the action through the receptor. C CK receptors are classified into peripheral type C CK – A distributed in the ile, gall bladder and intestinal tract and central type C CK – B distributed in the brain. The gastrin receptor and the CKK – B receptor show similar properties in receptor binding experiments and sometimes called C CK 1 B / gastrin receptor due to high homology. These receptors, such as gastrin or a CCK-B receptor antagonist compound, are useful in the treatment of gastric ulcers, duodenal ulcers, gastritis, reflux esophagitis, splenitis, Zollinger-EUison syndrome, cavitary G cell hyperplasia, basal hyperplasia, Choleditis, gallstone stroke, gastrointestinal motility disorder, sensitive bowel syndrome, certain tumors, eating disorders, anxiety, panic disorder, depression, schizophrenia, Parkinson’s disease, late onset dyskinesia, It is expected to be useful for treatment and prevention of La Tourette’s syndrome, addiction due to drug ingestion, and withdrawal symptoms. It is also expected that the induction of analgesia or the enhancement of induction of analgesia by opioid drugs is expected (Journal of Pharmacology, Vol. 106, 171-180 (1995), Drugs of the Future, Vol. 18, 919-931 (1993), American Journal of Physiology, Vol. As a gastrin receptor antagonist already, prolumide is known as a therapeutic agent for gastric ulcer and gastritis. However, proglumide has considerably low affinity for gastrin or CKK-B receptor and its therapeutic effect is weak. In addition, L – 3 6 4, 7 1 8 (Dibazepide, Japanese Unexamined Patent Publication No. 616366), L -3 6 5, 2 6 0 (Japanese Patent Laid-Open No. 6 3- 9), and the like, have been reported to exhibit either CKK-A receptor antagonism or CKK-B receptor antagonism. Furthermore, it is disclosed that a compound having a strong C 4 C – – B receptor antagonistic effect suppresses gastric acid secretion by pentagastrin stimulation (International Patent Publication WO 94/438, International Patent Publication WO 95/18110) , It is not always satisfactory and clinically applicable gastrin or CKK-B receptor antagonist has not yet been provided. Compounds capable of strongly binding to gastrin or cholecystokinin receptors are expected for the prevention and treatment of diseases involving their respective receptors in the digestive tract and the central nervous system. Applicant Zeria Pharmaceutical Co., Ltd. 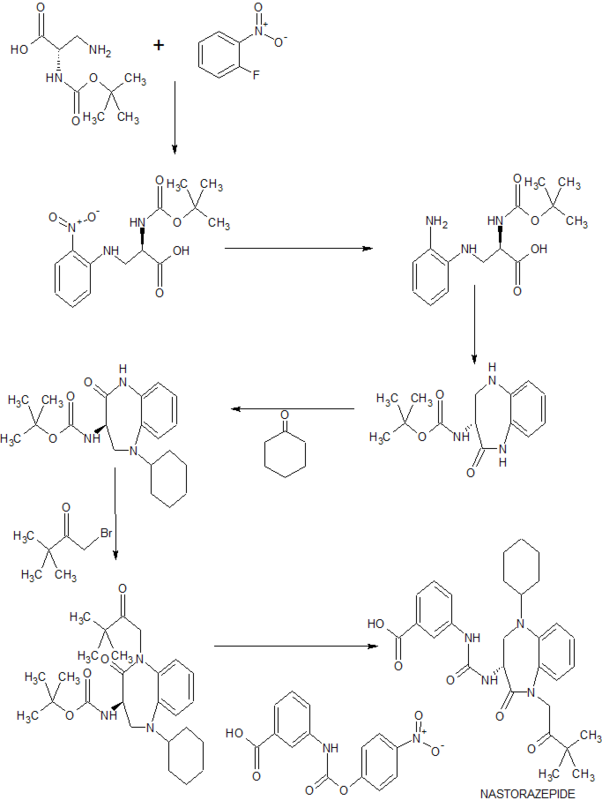 Compound A ((R) – (-) – 3- [3- (1-tert-butylcarbonylmethyl-2-oxo-5-cyclohexyl- 1,3,4,5-tetrahydro- 2H- 1,5-benzodiazepine -3-yl) ureido] benzoate) has the following structural formula and can be produced by the method described in Patent Document 1. Compound A 20.0 g of amorphous substance was suspended in 253 mL of methanol. After dissolving by heating, it was cooled and the precipitated crystals were collected by filtration and washed with methanol. The obtained wet crystals were dried under reduced pressure. The powder X-ray diffraction spectrum of the obtained crystal is shown in FIG. 2. From NMR, IR and FIG. 2, the obtained crystals were Compound AI type crystals. Compound A 50.0 g of amorphous material was suspended in 380 mL of isopropanol (IPA). After dissolving by heating, it was cooled and precipitated. Precipitated crystals were collected by filtration and washed with IPA to obtain wet crystals. This was dried under reduced pressure. The powder X-ray diffraction spectrum of the obtained crystal is shown in FIG. From NMR, IR and FIG. 4, the obtained crystals were Compound AIII type crystals. Process for producing a calcium salt of a 1,5-benzodiazepine compound – nastorazepide calcium – a cholecystokinin CCK2 receptor antagonist. Useful for the treatment of gastritis, reflux esophagitis, Zollinger-Ellison syndrome. (1) (R) – (-) – 2-Oxo-3-tert-butoxycarbonylamino-5-cyclohexyl-1,3,4,5-tetrahydro-2H-1,5-benzodiazepine (compound 2)), 139.3 g of 1-chloropinacolone and 8.3 g of tetrabutylammonium bromide in 1432 ml of toluene was added dropwise 461 g of 30% sodium hydroxide aqueous solution at 10 ° C. or lower. After stirring for 1 hour, the aqueous layer was removed. To the toluene layer, 620 ml of water was added and the liquid was separated, and the toluene layer was used for the next step. (2) 628.9 g of hydrochloric acid was added dropwise to the toluene layer obtained in the previous step at 30 ° C. or lower. After stirring for 30 minutes, liquid separation was carried out, and the aqueous layer was separated. It was neutralized with 908.5 g of 30% sodium hydroxide aqueous solution and extracted with 1432 ml of toluene. The toluene layer was separated with 620 g of a 20% sodium chloride aqueous solution, and toluene was distilled off under reduced pressure. (R) – (-) – 1 -tert-butylcarbonylmethyl-2-oxo-3-amino-5- cyclohexyl-1,3,4,5-tetrahydro-2H-1,5-benzodiazepine (Compound (6) ) Was obtained. (3) The (R) – (-) – 1-tert-butylcarbonylmethyl-2-oxo-3-amino-5-cyclohexyl-1,3,4,5-tetrahydro-2H-1 , 5-benzodiazepine (Compound (6)), 221.8 g of 3-phenyloxycarbonylaminobenzoic acid, 174.5 g of triethylamine and 77.7 g of water were added and the mixture was stirred at 45 to 50 ° C. for 2 hours. To the reaction solution were added 1375 ml of ethanol and 930 ml of water, and 62.9 g of hydrochloric acid was added dropwise at 30 ° C. or lower. The precipitated crystals were centrifuged. The obtained crystals were heated to dissolve in 4714 ml of ethanol at 60 ° C., and 2790 ml of water was added dropwise to precipitate crystals. The precipitated crystals were separated by centrifugation and dried under reduced pressure to give (R) – (-) – 3- [3- (1-tert-butylcarbonylmethyl-2-oxo-5-cyclohexyl- 5-tetrahydro-2H-1,5-benzodiazepin-3-yl) ureido] benzoic acid (Compound (5)) 0.5 ethanolate monohydrate 430.2 g.
(4) (R) – (-) – 3- [3- (1-tert-Butylcarbonylmethyl-2-oxo-5-cyclohexyl-1,3,4,5-tetrahydro-2H- 1,5-benzodiazepine -3-yl) ureido] benzoic acid (Compound (5)) 0.5 Ethanol solvate monohydrate 430.3 g was suspended in 1645 ml of isopropyl alcohol (IPA), sodium hydroxide 31.6 g / A solution of 934 ml of water was added dropwise to dissolve (a). 112.7 g of calcium chloride dihydrate was dissolved in 3012 ml of water. Here, the solution of (a) was added dropwise at 10 ° C. or lower. After dropping, the temperature was raised to 50 ° C., after stirring for 2 hours, it was cooled to 10 ° C. or lower. The precipitated powder was centrifuged and washed with a mixed solution of IPA 658 ml / water 2065 ml, followed by 4303 ml of water and dried under reduced pressure to give (R) – (-) – 3- [3- (1-tert- Oxo-5-cyclohexyl-1,3,4,5-tetrahydro-2H-1,5-benzodiazepin-3-yl) ureido] benzoate (compound (1)). The powder X-ray diffraction spectrum was measured (as 7% water content), and the obtained compound (1) was amorphous. step (4) of Example 1, investigation was carried out by changing the amount of the solvent and sodium hydroxide. First, when the IPA / water ratio is 1 / 2.5 to 1/10, preferably 1 / 2.75 to 1/8, more preferably 1 / 2.75 to 1/5, the compound (1 ) Amorphous can be stably obtained. Next, when the amount of sodium hydroxide is 1.0 to 1.10 mol with respect to the compound (1) and the amount of calcium chloride is 0.5 to 1.5 mol with respect to the compound (1), the amount of the compound 1) can be obtained in high yield. Further, it was found that impurities are not produced when the reaction temperature of the compound (1) and sodium hydroxide in the step (4) is 20 ° C. or less, more preferably 10 ° C. or less, further preferably 0 to 10 ° C.
1: Kato H, Seto K, Kobayashi N, Yoshinaga K, Meyer T, Takei M. CCK-2/gastrin receptor signaling pathway is significant for gemcitabine-induced gene expression of VEGF in pancreatic carcinoma cells. Life Sci. 2011 Oct 24;89(17-18):603-8. doi: 10.1016/j.lfs.2011.07.019. Epub 2011 Aug 3. PubMed PMID: 21839751.